Updated 7:33 p.m. | Posted 11:26 a.m.
Minnesota Public Radio and its parent organization American Public Media said Wednesday they've cut all business ties with Garrison Keillor as they investigate a report of "inappropriate behavior" by Keillor involving someone who worked with him. 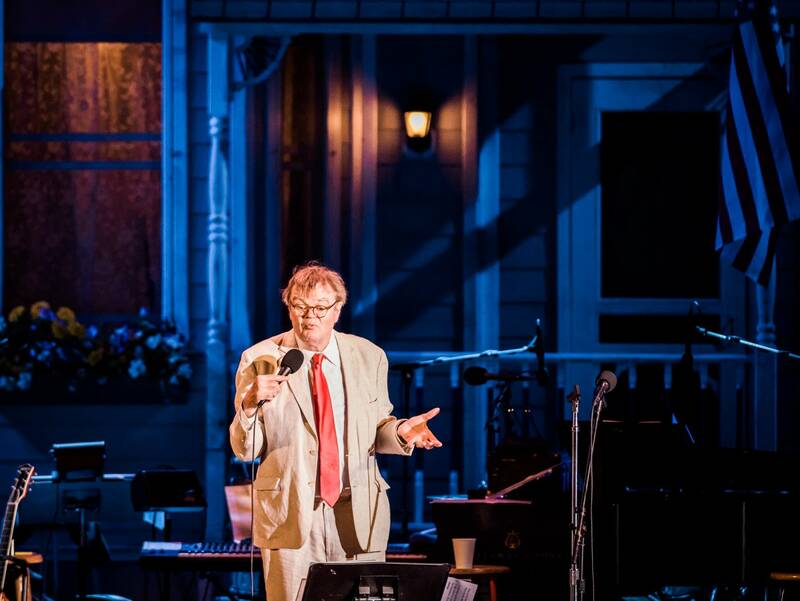 Keillor, whose connections to MPR go back nearly to its founding 50 years ago, retired last year from "A Prairie Home Companion," the renowned weekly music and variety show he'd created. He continued to produce "The Writer's Almanac" for syndication. • MPR News asks: What are your thoughts on MPR cutting ties with Garrison Keillor? Cutting ties with Keillor will bring several big changes, including a name change for "A Prairie Home Companion," which is hosted now by Keillor's successor, Chris Thile. "While we appreciate the contributions Garrison has made to MPR and to all of public radio, we believe this decision is the right thing to do and is necessary to continue to earn your trust and that of our employees and other supporters so vital to our public service," McTaggart wrote to MPR members. APM did not detail the nature of the claims against Keillor and executives declined substantial comment beyond the company statement, which was released shortly after Keillor sent a message to the Associated Press saying that he had been "fired" from MPR. In an email to the Minneapolis Star Tribune, Keillor wrote: "I put my hand on a woman's bare back. I meant to pat her back after she told me about her unhappiness and her shirt was open and my hand went up it about six inches. She recoiled. I apologized. "I sent her an email of apology later and she replied that she had forgiven me and not to think about it. We were friends. We continued to be friendly right up until her lawyer called." Later, in a message to MPR News, he indicated that two employees had raised questions about his behavior. "I have to respect the privacy of the two employees who made the allegations," he wrote. "I have my own recollection of events, but I don't want to take issue with Jon McTaggart's decision. I think the country is in the grip of a mania — the whole Franken business [a reference to sexual misconduct allegations against Sen. Al Franken] is an absurdity — and I wish someone who resist it (sic), but I expect MPR to look out for itself, and meanwhile I feel awfully lucky to have hung on for so long." He also posted a separate statement saying: "I've been fired over a story that I think is more interesting and more complicated than the version MPR heard. Most stories are. "It's some sort of poetic irony to be knocked off the air by a story, having told so many of them myself, but I'm 75 and don't have any interest in arguing about this. And I cannot in conscience bring danger to a great organization I've worked hard for since 1969." In a Facebook post written Wednesday evening, which appeared to be removed later, Keillor said: "It's astonishing that fifty years of hard work can be trashed in a morning by an accusation. I always believed in hard work and now it feels sort of meaningless. Only a friend can hurt you this badly. I think I have to leave the country in order to walk around in public and not feel accusing glances." Keillor, a Minnesota native, became nationally famous through broadcasts of "A Prairie Home Companion," which launched in 1974 in St. Paul. The show still attracts about 3 million listeners weekly and brings APM, the parent company of MPR News, millions of dollars in revenue annually. However, its audience has shrunk from some 4 million listeners a decade or so ago, MPR News reported last year. The company tapped Thile to take over the show, hoping he could grow a younger audience without alienating Keillor's fan base. Actress Sue Scott, who worked with Garrison Keillor for 24 years on the show, said she's shocked at the news, adding she's heard from other staff and cast members who feel the same way and who want more details. Scott said she's never known Keillor to behave in inappropriate ways. "I saw nothing, I really I have nothing to say," Scott said. "I'm stunned. I'm still sort of trying to take it all in myself." Keillor, 75, was scheduled to perform Wednesday night in Pittsfield, Mass. The venue, however, said Wednesday afternoon the gig had been canceled, adding, "Berkshire Theatre Group finds any victimization of people deplorable." Keillor has several books in the works, including a just finished memoir. He also has another Prairie Home movie project which he hoped to get into production soon. On Tuesday, the Washington Post published an essay by Keillor decrying calls for Minnesota U.S. Sen. Al Franken to resign over allegations that he groped and forcibly kissed a woman during a USO tour in 2006, before he became a senator. "This is pure absurdity," Keillor wrote, "and the atrocity it leads to is a code of public deadliness." The attorney leading the independent investigation has been conducting interviews and reviewing documents, and the investigation is still ongoing. We encourage anyone with additional information to call our confidential hotline 1-877-767-7781. We want a workplace where anyone who experiences unwanted behavior feels comfortable in reporting concerns to MPR. Discrimination, harassment, retaliation or other inappropriate behaviors will not be tolerated. • separate from the Pretty Good Goods online catalog and the PrairieHome.org website. MPR and APM will work closely with public radio stations to help make the programming transitions as seamless as possible. "Garrison Keillor has been an important part of the growth and success of MPR, and all of us in the MPR community are saddened by these circumstances," said Jon McTaggart, President of MPR. "Over the last several weeks, the special Board Committee has worked closely with MPR President Jon McTaggart and legal counsel to review the facts as we know them and carefully consider the implications of the various options," said David Murphy, Chair of the MPR Board of Trustees. "The Board Committee concluded that terminating the Keillor relationships was the appropriate decision and the Board and Jon are aligned in this action. Fortunately, MPR is one of the strongest public broadcasting organizations in the country. We are confident MPR will continue to innovate with programming and content that ensures MPR will remain one of the most valued sources of news, information and entertainment for decades to come."